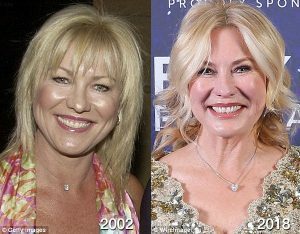 Beverly Hills plastic surgeon Dr. Randal Haworth believes that Kerri-Anne Kennerley may have also gone under the knife in recent years. She has never been shy about admitting she uses non-surgical treatments such as Botox and Fraxel laser to maintain her age-defying looks. ‘Mrs Kennerley looks better than ever compared to her former self 15 years ago. Though maintaining a healthy lifestyle and weight certainly helps, based on recent photographs, I feel that she enlisted the expertise of a plastic surgeon along the way’, Haworth told Daily Mail Australia this week. Dr. Haworth went on to speculate that Kerri-Anne has used dermal fillers to maintain her youthful complexion. ‘The small protruding ridges below the inside corners of her lower eyes while smiling indicate that Kerri-Anne may have had injections, such as Juvéderm Silk or Restylane, to fill her lower under-eye hollows at some point,’ Dr. Haworth claimed. Kerri-Anne, who hosted Midday from 1996 to 1998, recently confessed to 9Honey that she has no interest in looking ‘natural’ as she ages. ‘We don’t want to go natural! Natural is for 6am in the morning, I don’t think so!’ Kerri-Anne said. Last year, she also told The Australian Women’s Weekly that Botox and Fraxel laser were all part of her beauty routine.